It’s email dating 101: there’s nothing worse than waking up, checking your email, and find that annoying email from last night – trying to get back into your inbox for a second round. As with dating, a lot can go right in an email. The person you’re currently sharing your message with might just be the perfect customer for your brand. Your email might appeal to their needs and build a lifelong relationship. Or your recipient may discover that while you two have no chemistry, your product would be a perfect match for one of their friends. But (also like dating) a lot can go wrong. If you’re striking out in your email campaigns, you’ve got to tweak your pitch. 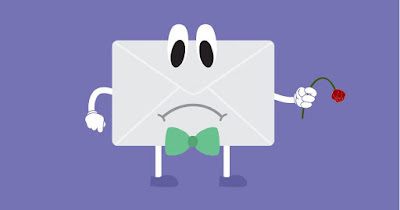 Here are nine reasons that marketing emails get rejected – any of these sound familiar? 1. Your subject lines made a bad first impression. Your recipient’s experience with your email starts before it’s ever opened – with the subject line. A lot is riding on these 50 characters or less. Some classic subject line “don’ts” include boring copy, ALL CAPS, excessive exclamation points, and – of course – deceiving messages. The subject line “Warning” or “Re:” might earn you opens, but it won’t earn you customers. What to do: A/B test all your subject lines. Make sure they reflect your email’s intent. 2. You bored them to death. Are your emails dry, long, and/or monotonous? Imagine that the recipient is looking for her shoes, her dog is barking to be let out, and she’s late for a meeting. She does not have a year to spend decoding and analyzing your jargon. This is your chance. Don’t waste it. What to do: Don’t be afraid of a little “edge,” a human touch, or even a fun, unusual inclusion. And don’t write a novel – the faster you get to your CTA (when you ask for a second date), the better. 3. You forgot to test your display. You wouldn’t show up to a date in a stained shirt, or with toilet paper stuck to your shoe – which is why you check out your appearance before you arrive. Email is similar. Don’t show up in your buyer’s inbox without testing your display. What to do: Before you send out an email, test it on all email clients – and don’t forget mobile. 4. You advertised a bigger, better, or cheaper version of yourself. Don’t exaggerate your height in your online dating profile, and don’t make false promises in your emails. Are you a car dealership? Splendid – I’m in the market for a car! But don’t claim your deals are “once in a lifetime” if you’ll be holding the exact same sale next weekend. What to do: You’re looking for a long-term relationship, not a one night stand. There’s no need to advertise your challenges, but if you highlight qualities you don’t really have, your customer will eventually find out. 5. You forgot his/her name. During my worst date in college, the girl admitted she’d forgotten my name. She explained that she’d gone on a lot of dates recently, but the damage was done. Guys and girls, you need to personalize your emails – at the very least, don’t use the wrong name. What to do: When you email your database, use first names if you’ve got them. This is easy if your marketing automation allows you to use “tokens” in your emails. 6. You brought up money too soon. Email is not the place to ask for a sale – it’s like asking your date to buy your dinner while you’re still eating appetizers. Many people read emails while they’re rushed, busy, or waiting in line for coffee, which is why an email is a great place to build relationships with your customers, or to educate them on your product or deals. Don’t address your greed – address their needs. What to do: Don’t mention pricing in your email. Mentioning a free trial or referral program is fine, but don’t overdo it. 7. You over shared. Again. Your audience doesn’t need emails about how you’re remodeling your building, or how your company recently celebrated its fourteenth month in business. Save these kind of updates for your blog or social…or for a phone call with your mom. What to do: Keep your emails about the reader. They should be interesting and entertaining to people who aren’t already 100% invested in your brand. 8. You came off as insecure. What to do: Take the high road. If you are truly better than your competitors, the proof will be in the results. Email marketing is about conversations. Don’t send multiple emails on a topic your audience isn’t interest in; don’t send the same email twice; and – if you have the technology – don’t offer them content they’ve already viewed on your website or on social. What To Do: Use marketing automation to listen and respond to your audience’s preferences and behaviors. Set up a subscription center. Run a survey. Listen. Ok, supernova: you are now prepped and ready to make it past the spam filters, past your audience’s apprehensions, and into their hearts. Still wondering why your emails are getting rejected? Drop me a line in the comments below.